A warm dressing that is sweet, salty, smoky, sour, and... BACON-Y! Hot bacon dressing, jazzed up with real maple syrup instead of refined sugar, then drizzled over a classic romaine wedge salad. It’s a combination of two retro recipes, and it is absolutely delicious! It’s time for some Retro Recipes for #SundaySupper. You know, those recipes that bring us back to mom’s or grandma’s kitchen, or just remind us of a time gone by. This week we are sharing our favorites, either made as we remember them, for the sake of nostalgia and sentimentality, or remixing them to update them to be more modern, whether it is taste, ingredient availability, or healthy and nutrition considerations. I sort of remixed two recipes in one – the classic lettuce wedge salad, and an old fashioned Pennsylvania Dutch Hot Bacon Dressing. While not “bad” for you, I think we all know that iceberg lettuce is pretty much void of any nutritional value. Not only for the health benefits, but also for the flavor, I do prefer darker leafys, like romaine, baby spinach, arugula, or mixed greens. There are two places where I will consciously make the choice to get a wedge of iceberg. One is a restaurant near my mom’s, Irish Eyes, in Lewes, DE, where they load up the wedge with blue cheese, bacon, and tomatoes. I usually opt for the blue cheese dressing over their recommended Ranch (since I swear I am one of the few Americans who hates Ranch dressing). This is my meal, it is so huge and tasty! The other is a great local pub, Tumulty’s, in New Brunswick, NJ with amazing burgers. I have been going there since I was a kid, and actually went for a burger when I was in labor with The Bug (talk about nostalgia!). Their house salad is a plain old wedge, but served with one of their delicious homemade dressings. I usually opt for their pungent honey mustard, or creamy and tangy blue cheese. Hot Bacon Dressing was first introduced to me in the form of a jar of gloppy stuff from my mother-in-law’s fridge. It was warmed in the microwave and served over iceberg lettuce. But then I was digging in a box of recipes she had given to The Hubby years ago, and found a recipe for Pennsylvania Dutch Hot Bacon Dressing scrawled on a scrap of paper. I use the term “recipe” loosely, because it was basically a list of ingredients and some vague instructions. So one day, I decided to wing it, and the dressing, in its “original” form, turned out delicious! It is definitely a favorite of The Hubby. So how did I remix these two classics? 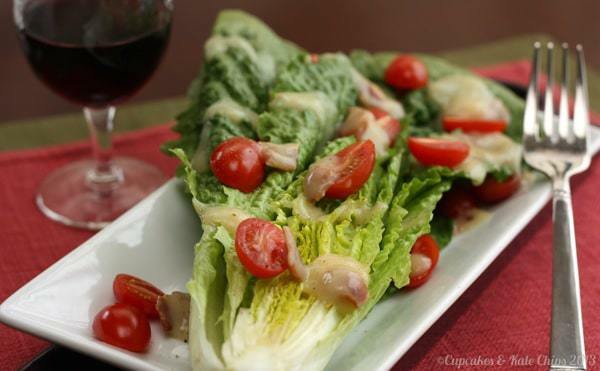 Instead of a quarter of a head of iceberg, I gave you half of a romaine heart with some halved grape tomatoes. The dressing is made gluten free by using cornstarch instead of flour, and made without refined sugar, by using super-flavorful real maple syrup. A leaner center cut bacon is also used, though I have made the original recipe with turkey bacon in the past, and have been quite pleased with the results. We also like a little more tang, so I upped the vinegar. Perfection! No recommendations from The Bug, because while he is a pretty good eater, I cannot do anything to get him to eat anything raw, green, and leafy. Even if I cover it in sweet, creamy, hot bacon dressing goodness…. Crazy kid! But from The Hubby – big thumbs-up! I also managed to polish off the leftovers for lunches the rest of the week. I will never turn down hot bacon dressing! Make sure to check out all of the other super-fun Retro Recipes at the bottom of this post! What is your favorite “retro” dish? Do you like the classic version, or have you updated it? Please let me know what you think of the maple twist on the hot bacon dressing! Lay the romaine heart on a plate, cut side up. Top with the tomatoes, pepper, and a few spoonfuls of the warm dressing. I’ve never had a warm dressing, but this definitely sounds delicious and would be something I would try! I think you will enjoy the warm bacon dressing! My dad loved ambrosia salad. It was his favorite thing to find at potluck dinners at his church. My mom would make it occasionally. What memories I have with this. Thanks for sharing yours. Ohhhhh this sounds heavenly – love it! I remember my mother making what she called wilted salad with a hot bacon dressing…and I loved it! 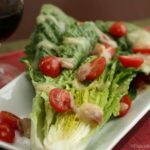 This one sounds great, and I love the idea of using Romaine instead of iceberg, though it may be hard to give up the blue cheese dressing I love! You know what, when I had leftovers for lunch during the week, I sprinkled some blue cheese on top! Yum! who doesn’t love warm bacon dressing? I would love to just devour this salad right now. I would love to try this recipe with kale or spinach. Yummy! Yes, I want to try with spinach next time. Kale is a great idea, too! It really is a nice combo and contrast! I love salads, and I’ll eat the iceberg if I am at a restaurant and that’s what I get, but give me some mesclun greens or arugula or baby spinach anyday. And this is TOTALLY healthy! I have come to prefer the mixed greens and romaines, but this is yummy on anything. I’m absolutely loving your rendition of a wedge salad! Since I can’t stand blue cheese, I never order it, but this! This I could eat all day long. Wow – what a great combination. I love making homemade dressings and this one is making my mouth water. I had an amazing salad years ago that plagues my memory. It combined bacon with blue cheese, and I’m trying to imagine if this dressing would work with blue cheese… thanks for the inspiration. The dressing looks interesting and delicious! Love the change by using baby spinach…lovely! I think it would be awesome with spinach! Love BACON! I am going to definitely bookmark this to try this dressing. Thanks! It is quite good! Um, I may have licked a few spoons while making salads last week! We rarely buy salad dressing. They are just so easy to make. This one looks like a good addition. I try not to buy it too much anymore, either, though my hubby likes French, and I don’t so haven’t made it. I stick to vinaigrettes, and it is so not worth buying them! This dressing would be great over arugula. It all sounds interesting with the maple syrup, so very retro! Lettuce is so plain it really needs bacon! Oh yes, it would contrast nicely with the peppery flavor of the arugula! Sweet, tangy, bacony, goodness = heaven in my eyes! I love hot bacon dressing from up North! YUM! Gorgeous photos too! Thanks! It is soo good! That dressing sounds amazing! I love wedge salads. It really is so unique! I love this salad! What a great updated version, the dressing sounds fabulous! Thanks! It is a fun recipe! This looks delicious! I think wedge salads are making a comeback, because I have seen a lot of them in the past couple years. And you seriously can’t go wrong with BACON! I don’t eat tons of bacon, but I love using a bit to really amp up the flavor! Nice job on combining two traditional salads together. It looks wonderful! oh YUM! I love wedge salad, and I love the idea of changing it up with a hot bacon dressing! The hot dressing is such a delicious surprise! My hubby and I would both give this salad our thumbs up! It looks delish!!! Thanks! It is a great one! I don’t eat many salads but I may start looking at this! Bacon dressing can convert any non-salad-person! I love your approach to the wedge salad! Really creative and a get make-over for health and flavor!! Thanks, I really hate that so many salads are so terrible for you! That looks so much better than any Caesar-ish thing I’ve had! Thanks! I am not a huge Caesar person to tell you the truth. Looks delicious! I also like the non-nutritional iceberg, slathered with blue cheese and bacon with tomato wedge on the side. very 50’s-70’s old steakhouse. You are too young to remember! 😉 Think I will try your version tonight!! YUM! I have been to one of those old school steakhouses in NYC that still essentially has the same menu, and the tradition endures! Oooh, this dressing sounds incredible!!! I love that it’s warm…kind of a nice little twist! The warm creamy dressing play nicely against the cold, crunchy lettuce. I absolutely love the update! That dressing sounds amazing! Thanks for sharing! I love how you combined the too hot bacon dressing and the wedge. I have seen a romaine wedge a few times now, but never tried. I think I need to see because simple salads like this are often my favorite. I tried making that grilled romaine wedge over the summer. Very tasty, too! I think that would be good with this dressing. That crazy kid…I’ll eat his portion! Well, he’ll eat slices of bacon, but put anything leafy green in there, and forget it! You had me at bacon. This is one gorgeous salad. The funny thing is, I tend to use it in small amounts, almost as a “seasoning”, but the flavor has a huge impact. Bacon, bacon, bacon! Seriously though…It sounds like a wonderful salad. Homemade dressings rule! I agree about homemade dressings! I don’t eat a tone of bacon, but here it is perfect! This dressing looks and sounds amazing!! I am so excited to try this out. Thanks for sharing it. Thanks, it is very tasty!